God bless the creator of the travelling cocktail kit. Here was a man (or woman) who challenged the possibilities of successful living; who had a keen understanding of those priorities that make for the puzzle pieces of a whole existence. While it’s feasible that the slinging of a 30-pound leather case over one’s shoulder can whisper inconvenience, it’s inarguable that this mobile vault of spirits will singlehandedly change the spirit of any trip, prompting nothing less than spirited adventure, if only by way of a shaker, a jigger and a dream. God bless you, you…genius. You hero. You saved us all. Except, there’s one footnote: That travelling cocktail kit is an unnecessary accessory in a city of particular bounty. Kansas City. By night (or by day, depending on one’s day), this city transitions into a constellation of cocktail destinations. It’s a unique galaxy in these lower Great Plains—one with a special vocabulary of phrases like “barrel aged” and “house-made grenadine”—that seeks to welcome, and not just those customers who breathe the secret password. But it wasn’t always that way. Brush those moth balls off the DeLorean, and take a Sunday cruise back to the bone-dry landscape of the Prohibition era. KC political leader “Boss” Tom Pendergast engineered an alcohol irrigation system that established Kansas City as a nightlife capital in the 20s and 30s. “He was really the guy in charge who kept the saloons open and the nightclubs open, so Kansas City was commonly referred to as a ‘wide open’ town during that time,” says Manifesto speakeasy co-owner (and Imbibe magazine’s 2013 bartender of the year) Ryan Maybee. Nearly a century later, Maybee leans on that history to lead a Kansas City cocktail renaissance. His pioneering of a progressive cocktail scene is one expression. Another is the Paris of the Plains Cocktail Festival, which he co-founded with Doug Frost and Brandon Cummins. Held the week before Labor Day, “POP Fest” highlights cocktail and spirits by way of education, tasting, and full-on drinking. POP Fest only accounts for four days, however, so what about the remaining 361? Good news: Kansas City continues to irrigate through a craft cocktail movement reflecting the best of what a growing national effort can muster. The highest concentration of outstanding cocktail destinations is within and around the city’s arts district, the Crossroads. It’s a fitting complement: a proper cocktail is as much of an artistic endeavor as is any painting (said me after his fourth cocktail). But the people of this city sustain notable destinations across the region. So we work ourselves inward, starting north and south. Jonathan Justus has defined himself nationally with an interpretation of regional cuisine that speaks that a la mode language of farm-to-table. 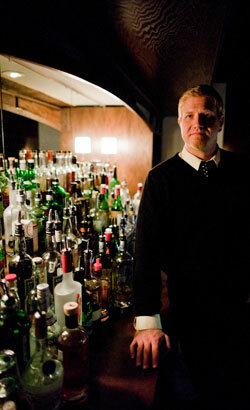 His restaurant is Justus Drugstore, and his cocktail program is a charismatic extension of his brand. Who else, for instance, would make their own sweet and dry vermouths? (The sweet version features over 60 ingredients.) Most exciting is Justus’ elixir du jour, a hyper-seasonal daily cocktail special that rarely repeats. Today, it’s a lilac gin number featuring a variety of peach so rare that Kansas City’s botanical garden (Powell Gardens) asked for the seeds. Jonathan grows the peaches in his front yard. And he probably blows the glass in which the drink is served. Probably. When Megan and Colby Garrelts launched Rye in late 2012, they opened the floodgates on an indefatigable stream of national attention: a cover story in Saveur; recognition by Bon Appétit as one of the 50 best new restaurants in the U.S. in 2013; Etcetera. And Rye’s cocktail program is at the heart of its excellence. Anchored by cocktails like the Barrel Aged Boulevardier (pre-mixed and then aged in a charred American white oak barrel for three weeks), and the State Fair (which shines thanks to its caramel corn infused bourbon), Rye is the go-source for liquid sustenance in Johnson County. Rye’s sister restaurant, Bluestem, is the flagship of the Garrelts’ empire-in-training. Staffed with bartenders sporting names like Lazer and Van Zarr, patrons might mistake Bluestem as the rave capital of Kansas City. Fortunately, it’s not. Instead, it’s a destination for the kind of modern cocktails that complement its James Beard Award-winning modern culinary program. This past summer, guests sipped the paloma shrub, a spin on that classic cocktail that combines grapefruit soda and tequila. The paloma shrub begins with a homemade grapefruit “shrub” (reduced grapefruit nectar fortified with Champagne vinegar), which bartenders blend with Espolon blanco tequila. Equally as enticing as the cocktail program is the space itself—chic, low key and buzzing with a subtle energy. Blocks away from Bluestem, Port Fonda is Kansas City’s authority on culinary-driven, authentic Mexican food and drinks. Port Fonda features cocktails and spirits of all natures, but it emphasizes craft concoctions rooted in tequila or mezcal. Margaritas are the star of the show (they’re so popular that the restaurant serves them on tap), but the A-lister among that exclusive circle is the Rozelle, a pink margarita combining Milagro blanco tequila, hibiscus-infused simple syrup, Solerno blood orange liqueur and fresh lime juice. And Saturdays and Sundays, a build-your-own Bloody Maria bar offers more ingredients than you have in your house. The Kill Devil Club, Extra Virgin and Grunauer are all leading cocktail destinations in the heart of the city. But it was Manifesto that vaulted Kansas City into the national cocktail dialogue. It’s a speakeasy-style venue, which means it plays hard to get. Walk to the back of 1924 Main Street, ring the bell, and then descend one flight down into the city’s darkest and most seductive drinking venue. The cocktail list is as extensive as most restaurants’ food menus, and each offering is as special as a snowflake—the rare breed that’s slightly unsteady and slurs every fifth word. The Winter in Buenos Aires, frontrunner for the metro’s best cocktail, has been on the menu since day one, and blends cachaca (Brazil-born sugarcane liquor) honey, cinnamon, lemon and roasted butternut squash into that version of heaven that’s mixed 007-style. A drink called The Pendergast, however, is where this story—the story of Kansas City cocktails—begins and ends. Built from bourbon, sweet vermouth, Benedictine and Angostura bitters, it’s the go-to drink for anyone looking to step back in time. Just under a century ago, Al Capone could have been standing next to you. He lodged at The Rieger (originally a hotel) when in Kansas City for meetings with the real Pendergast, Boss Tom, whose office was on the same block. Those meetings built a nightlife. Inspired a population. And established a reputation for cocktail excellence that’s more relevant today than ever before. Welcome to the new Kansas City: The city of fountains. And cocktails.